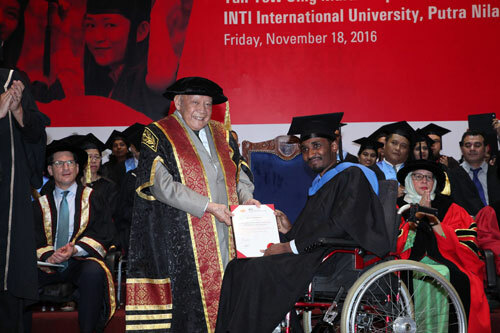 What would seem like an impossible feat to some became a reality for wheelchair bound Hamza Waziri Muhammad, 25, who recently received his Bachelor of Business (Honours) in Business Administration from INTI International University, Nilai. The Nigerian native who was diagnosed with poliomyelitis at the very young age of six years, which caused the paralysis of his lower body, endured a lot of hardship and struggles to make his way to Malaysia and earn an international degree that he longed for. “I was determined to chart a future for myself despite my limitations and I faced a lot of these struggles during my primary and secondary school years in Nigeria. From the lack of proper ramps to disabled friendly toilets, it was such a challenge for me to move about. With all the struggles I faced, I knew my father would be hesitant about me leaving to a foreign country to get an education. With that in mind, I had to do something by myself to prove to him that I am capable of going abroad to study,” shared Hamza. From sourcing universities abroad and available state scholarships to going through numerous bureaucratic processes back in his home, Nigeria, Hamza took it upon himself to challenge the status quo of people with disabilities and made every effort from the time he was 17 years to be a source of inspiration to young Nigerians who are in similar circumstances. Travelling thousands of miles away from home by himself to Malaysia to study at INTI was an arduous task which he willingly endured to prove a point that physical disability is no barrier to studying abroad. With the support of family, specifically his brother who is an INTI alumnus, fellow friends and an unwavering spirit to beat the odds, Hamza journeyed for four years with INTI to grabbed opportunities that came his way to gain a wholesome campus experience. From participating in extracurricular activities to employer projects, Hamza enhanced his knowledge and skills along the way while making friends of different races and nationalities. “My INTI experience has been a great one as I can recall how the faculty and staff here have been so supportive from day one. There were quite a number of structures that were built specifically to assist me to be more independent in my movement around campus and I’m grateful for their concern and support which has made my campus experience pleasant in these past four years that I have studied at INTI,” shared Hamza. 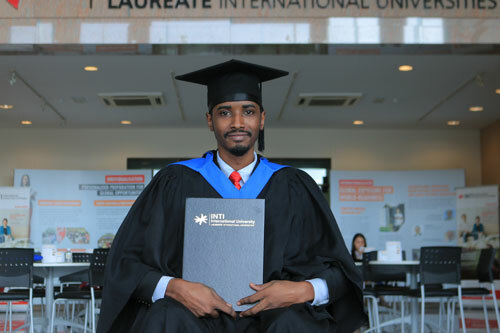 Beyond the facilities to accommodate to his daily needs, Hamza also attributes his success to the faculty members and lecturers who have shown great care and assisted him through his time as an undergraduate student at INTI. Showing no signs of stopping and a great fervour for education, Hamza hopes to continue his pursuit for academic excellence via INTI’s Masters of Business Administration. “By God’s grace I will be able to pursue my MBA and until then I hope that others like me will never give up on their dreams and pursue their passions. I can guarantee that the road will be tough but I am certain that so long as we have a determined mind, we can achieve anything,” shared Hamza. Hamza joined over 400 fellow graduates from INTI’s class of 2016 during the convocation ceremony which was officiated by INTI International University’s Chancellor, Yang Berbahagia Tan Sri Arshad Ayub. “At INTI, we believe in cultivating a culture of inclusiveness and developing individuals with a strong will to succeed. Providing a conducive learning environment is critical in enhancing a student’s university experience and we are glad to have journeyed with Hamza in his pursuit for an education at INTI. Hamza serves as an inspiration to all our INTI students that there is no barrier to achieving success. We hope to continue to be the firm foundation for many students like Hamza and progressively improve for the future,” shared Professor Dato’ Dr Rahmah Mohamed, Vice Chancellor of INTI International University.